Whether on the job, in your home, or hiking the Apalachian Trail, knowing First Aid allows you to help someone who becomes injured or ill.
First Aid is the initial help given to a person who has become sick or injured. The course includes recognition and treatment of Allergic reactions, Fainting, Diabetic problems, Stroke, Seizures, Bleeding, Broken Bones, Shock, Breathing problems and more. Learn how to control bleeding, splint fractures, handle heat or cold related emergencies. We offer several courses and specialty courses, depending on your needs. Basic First Aid: The course is availble either on-site as a six hour program or via a combination eLearning (Internet based) course with skills practice conducted in our Woburn training session. Advanced First Aid: A two-day (17) hour first aid program that, in addition to the topics covered in our Basic First Aid program, covers Anatomy, practice in lifting and moving injuried people, airway management, medical and trauma assessments, Multiple-Casualty Incidents and Principals of Triage, Childbirth, Blood Pressure Monitoring, etc. This course requires BLS Provider certification as a pre-requisite. Advanced Bleeding Control: Traumatic injury is one of the leading causes of death for people under 50 years of age in the USA. A large portion of those deaths are from severe bleeding — the most treatable cause of death due to trauma. This course covers topics such as tourniquets and hemostatic dressings. Emergency Oxygen Administration: Many medical emergencies cause oxygen to be depleted in the body leaving the victim and risk for shock. This two-hour program focuses on administering emergency oxygen to breathing and non-breathing persons, emergency oxygen delivery systems, and integrating pulse oximetry. This course requires CPR or CPR and First Aid certification as a pre-requisite. Wilderness First Aid: Our Basic and Advanced First Aid courses assume that Emergency Medical Services can respond quickly to the emergency. 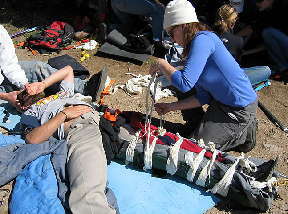 However, when more advanced care is delayed, such as when you are hiking or camping, specialized training is required. That training, Wilderness First Aid, takes into account such things as limited access to medical supplies, exposure to outdoor elements, and extended response time for professional help. Long hikes, extended lengths of river, large expanses of ocean, and miles of asphalt may separate the person from a medical facility. You, as a provider, and the ill or injured person may have to endure unexpected heat, cold, rain, wind, or darkness. The equipment needed for treatment may have to be improvised from what is available, and communication with professional medical responders may be limited or nonexistent. This course requires CPR and Basic First Aid certifications as a pre-requisite.